The first combat airman captured in US uniform by the Germans was Lt Col Albert P Clark, who then spent 33 months in the infamous Stalag Luft III where he was "Big S" in planning the Great Escape. Many fascinating stories of the Great Escape have been told since the end of World War II. Not until now has the story of Lt Col Albert P Clark, the first combat airman captured in US uniform by the Germans, been told. 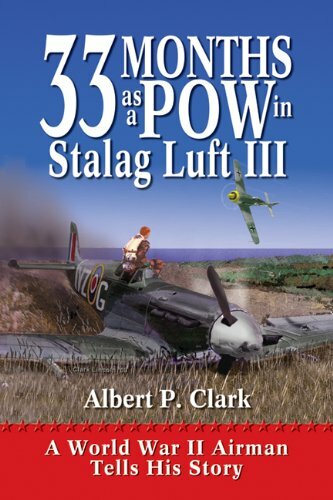 In his 33 months in the infamous prisoner of war camp Stalag Luft III, Lt Col (General, when writing this book) Clark was involved in and responsible for directing escape work among American prisoners. His tale of courage and perseverance is accentuated by the stark photographs he took from the inside with a pinhole camera. This book includes previously unpublished photographs collected from the Special Collections Branch of the Air Force Academy Library of the German POW camp known as Stalag Luft III in Zagan, Poland. Clark served in the US Air Force during World War II, and as a US Air Force officer in France, Germany, Saudi Arabia, and Okinawa and finally served as superintendent of the Air Force Academy before retiring in July of 1974 in the grade of Lieutenant General after 38 years of service. As the senior ranking American officer, Lt Col Clark was responsible for the men in the prison camp. He knew about everything that went on and organized most of the projects, including the Great Escape. His book reveals many details which were classified to his fellow POWs. You will learn many untold stories about Stalag Luft III from the top man himself.